What Vintage or Discontinued Perfume Do You Want to Know More About? 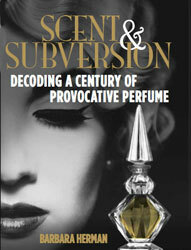 I'm encountering more and more perfumes of the "obscure" or forgotten variety that I love and want to feature in my upcoming book on 20th century perfume, Scent and Subversion. But I want to be able to say something substantial about them, and I often find that when I have some notes to hold onto, I don't feel like I'm sinking into the "impalpable effluvia" of perfume (as Italo Calvino described it). I love perfume (obviously), my nose isn't half bad at detecting notes, but I'm not a perfumer or a chemist, so my educated guesses are just that — guesses. Which brings me to the point of this post. I've enlisted the amazing Octavian Coifan of 1000Fragrances blog fame to sample a list of fragrances I'd like to get a better grip on. (For those who don't already know, Octavian is a perfumer, perfume historian, and writer who is not only able to detect specific notes/accords — both natural and synthetic — he's able to situate the perfumes in the context and history of other perfumes. He is amazing.) I've got my own list of perfumes, but I'm curious, are there any beloved perfumes you're holding onto that you know nothing about, even after scouring the Internet and books? Tell me what they are, send me a 1 ml sample (if you have one) that I will forward to Octavian (is that not the best name ever? ), and we'll both work on figuring out what the heck is in your beloved. Thank you! Is Ciro Danger on your list? I absolutely love this, but know very little about it. I don't have any perfumes to contribute, but how amazing that Octavian is putting his skills to use in this way! breathesgelatin: From the first few months when I started blogging about perfume in 2008, Octavian has been wonderful about answering questions and sniffing things out I was curious about. (All from Paris — swoon!) He loves perfume and educating people about it. In short, Octavian rules. ;-) Come back if you can think of anything! Hi vinery! Danger and Reflexions by Ciro are on my list! I have a tiny bottle of Danger that may be a little too dark and not in tip-top shape, but you can tell what the basic structure was. Love their bottles and ads, too! Please come back if you think of anything else. On Facebook, some of the others were: Bakir, Skinny Dip, and Avons That Man, Lenthéric's Dark Brilliance. How about Jacques Fath's Expression? I think...I think maybe it's like Vol de Nuit, but I would like to know for sure. Do you have that on the list?? Mimzy by De Raymond, which was originally released in 1925. I scored a bottle with some perfume left and it has totally taken me over. I and in love but cannot find anything about it anywhere! Hi Cyn, drop me a line and let me know if you have some to spare! I do! I would love to share some with you. Email me at yesterdaysperfume@gmail.com, Cyn, and Ill give you my address. Fun! I don't know about some vintage perfumes but I want to know more about something about them. I want to know if what generation is the most perfect perfume for some men like me. Eek, the list of obscure but beautiful vintage perfumes I love is very, very long! Far too long to post here. But I second the interest in Ciro Danger (my favorite Ciro thus far) and Jacques Fath Expression (a very "brown" smell if there ever was one; think Prince Matchabelli Cachet but darker and with a touch of either cocoa or coffee to give it a friendly gourmand edge). I'm also loving the super-obscure Russian Leatherette by Louis D'Or, Houbigant Wistaria (which Octavian has already blogged about), and a host of others. It makes me sad to think that some of these perfume houses worked so hard to create such great scents, only to find that their legacy has been barely remembered. Hello, I'd like to know more about Gauloise by Molyneux, it came out in the late 70's or early 80's, discontinued now. It was my mum's perfume and I loved it. I wish I had a sample. I like the sound of Russian Leatherette. I agree with you that its sad that some of these works of art will just disappear. Ive been fortunate to have encountered some of them, and it sounds like you have too! If there are any you can spare, let me know, and I can send you some empty vials. Hi Pascale. Ill look for Gauloise. Both Molyneux perfumes Ive tried have been fantastic: Fete and Le Numéro Cinq. Hi Brie, I have notes for the Alexander Julian and Ill find out Victoria. That shouldnt be too tough. The other one Ill have to search! Do you have on your list the Cordays from Perfume Set to Music? I know you have Toujours Moi, but how about the others? Yes, I would like to know more about Possession by Corday. Thanks. Hi Vinery, I also have Fame, but I don't have the other Cordays: Tzigane, Possession, LArdent Nuit, or Jet. I think Jet is readily available, the others have been hard to find. The original Courreges from the mid-seventies. It was my favorite, but except for one friend of mine(who also adored it), nobody seems to recall it. I think it was discontinued in the late eighties, early nineties. Nothing smells remotely similar, and I have never seen it mentioned in any blog, anywhere. I believe there are woodsy powdery components. I actually hired a perfume detective to find it, however, since Courreges named all his fragrances pretty much the same, she found a men's fragrance rather than my passion. Mine was a "concentrated" cologne sold in four and eight ounce trademark tall cylander bottles with the round gold cap. The perfume, which I found once was swoon inducing. Any information would be appreciated! I have no affiliation with this person, and I can't vouch for it, but if I loved a perfume as it seems you love this one, $19.99 seems like it'd be worth the (small) risk of disappointment. Happy 4th, and hope this helps! I look forward to trying this one. Thanks for the tip. Thank you for the info! Actually, where the perfume detective failed, I succeeded! Shortly after the mishap, I literally stumbled upon three full bottles on the top shelf of a local discount perfume shop. More recently, I found someone on ebay with a fairly large stock of still sealed bottles in both sizes which he found in the back of his parent's old shop. So, I'm pretty much set for life. Being that they are well over thirty years old, the top notes are shot, but, it still smells lovely if you can wait it out. I would be delighted to send you a sample. I'm not enough of an expert to identify notes, classification and so on, but I'd love to have you write about it, since it seems so long and totally forgotten. I also love Empriente, but not as much, obviously. So sorry! I see you said you bought a mini, so you won't need my sample after all. As I said, I'm set for life with several full bottles in addition to my other vintage perfume loves. I can't wait to read your opinion of it! One other holy grail is Geoffrey Beene's Red. I just remember smelling it in the seventies and loving it. Have heard almost nothing about this one either. Hi Francine, I assumed you didn't have any, so I got some myself! But that is a wonderful score of three bottles. I'll let you know what I think when I get this. Take care! Hooray! Octavian's on board. Let me send you Diane von Furstenberg's Volcan d'Amour. It's another heady and hard-to-find dark amber juice with some resemblance to Mollie Parnis, tho a more incensy drydown. Discontinued, it is an 80s powerhouse that teeters between head shop and Studio 54. As to Mollie's drydown, I was so in love with that ketonic peachy blast it opens with (and that I sustain through the crafty cotton wad in the bra trick) that I'm only now appreciating the drydown. What do I smell? Honeyed tobacco and leather. I think that for a less experienced nose like mine, note identification can be a matter of associations, sometimes even childhood memories. Yatagan, for instance, reminds me of the half smoked ciagrs my grandfather left lying in an ashtray, a smell I just loved, but who would admit to "old cigar" accord? My list--Le Dix (Balenciaga)and Ecusson. Thanks, d57. Ive written about Le Dix on this blog, and Ecusson will be in my book! I would love to learn more about Styx. It seems to have come out again in the '70's and I bought some then and absolutely loved it. This vintage perfume is for sure difficult to find. I would love to own one. Hi Miruna, I share your interest! I'm still trying to gather together some Corday perfumes, including Jet, L'Ardente Nuit and others, which I'll write about in my book. (The Corday ads are also among the most strange and beautiful of vintage ads!) I've written about Tourjours Moi and the actual album, Perfumes Set to Music. Hello - I was wondering about the id of a mini I picked up at a yard sale last year. Let's see if I can draw it with words for you. First off it is round - round like a coin, not like a ball. It is around 1 1/2 - 2 inches (35-50 mm) in diameter. The clear glass is pink. Not a garrish bubble gum pink but a soft, feminine verging on purple-y pink. The cap is a little gold metal crown with a tiny purple gem at the very top of it. The one side (reverse probably) of the bottle looks like a representation of a woman's bare neck and shoulders draped in a luxurious mink stoll while the obverse there is a flat space of about the size of an American quarter where I'm certain the label used to reside. The crown unscrews and there is a little glass wand of about 30 mm (1 1/4") in length attached. The juice inside is a green that when you look through it, it turns the bottle a nice ambery-orange. The smell is very soft and feminine. I am on vacation right now so cannot measure precisely or take a picture but does any one have any ideas? Have you ever heard of a perfume whose name starts with a "year"...i.e., 2012, 2011...etc. Those are not the correct years of course, I'm thinking the "year" is much older, 1800's or something. I do not know the maker - I've only smelled it once on an elevator about 3 years ago and I asked the name of it and she told me but I have forgotten. It runs in the $180 range - something I wouldn't normally buy - I know I haven't given very much information - it's all I have and now I'm obsessed with find it. Thank you. JCP used to sell a cologne I cannot remember the name of. It was inexpensive and came in a clear bottle with a sea foam colored plastic cap-quite plain. They stocked it especially at Christmas time. It was a very light, lovely scent. I don't suppose anyone can remember this fragrance? I am overcome by madness! Help! My quest of 30 years (including sending an empty bottle to the Middle East with a relative-no result)for Bat Sheba perfume has concluded with new information AND new questions! I have been buying little bits at a time, everything I'm reading indicates a dual question: is it Exotic Oriental or Woody Modern? NOBODY has addressed this: There has to be ONE Bat Sheba out there that is neither designation, IT JUST IS BAT SHEBA!!! It's what I've been trying to find, it is my Holy Grail. I have some. 98% of what arrives at my door are Judith Muller's "line" of Bat Sheba with an additional name. I hope this makes sense. There is a pure element out there and it's not being addressed. Help. Lou Lou, by Cacharel -- I just love that stuff. I'm addicted to it. It was discontinued years ago and it's very hard to find now. Geoffrey Bean had a woman's fragrance in the 1970s and he retired it. I have been obsessed with that smell all these years. I can find nothing about judith muller shalom vintage in leather pouch does anybody have info? Estimating the worth of perfumes isnt really my expertise, but you can get some idea of what vintage Aramis is worth by looking up vintage Aramis on eBay. Their prices tend to be inflated. Hope that helps. Good luck! Since theres only about 20 percent left, Id offer maybe $20 and see what they say. Good luck. looking for a perfume my wife wore in 1974, till early 1980,s. was purchased at drug stores like super x and was green in color. Bottle tall and slender with a fern in the bottle. It was real fern a pine tree type scents, and it drove me nuts Still together after 37 years and would like to get her some. Can any body help with the name??. The fern was IN the bottle, or on the bottle? Ill send this description out on Facebook and see what anyone can tell me. Ill get back to you. I would love to hear your thoughts on Joop! It's one of those scents that came out in the 90's when I was in high school. About once a year, someone will walk by me and I catch a whiff....and I know it right away! I have a bunch of old obscure perfumes - one is called "Sibonne" New York, Chicago - it cost 5.50 originally. And I have Darcel "Blue Gardenia." I also have one called "8:30" I have no other information about these except what I've told you. I can’t for the life of me remember the name of a Lancome perfume which I loved back around the 80s, (Think it was manufactured in the 70s though). Still have the bottle but it is overseas, the bottle is oval in shape and the name ends in “ión”. I used to purchase a cologne (possibly a perfume) from the Jones Store Co. in downtown Kansas City, Missouri around the 1970's. All I can remember is that I think the packaging was square and red in color. I learned a couple years ago that it has been discontinued, but now I can't recall the name. If anyone has an idea as to what it might be, I'd love to find a vintage bottle to purchase. I'm trying to recall a set of perfumes and bath products (soaps, lotions, etc) from the 1980's that were sold in mid-range department stores. It was called Benarde or something like that and was in blue packaging. Smelled really nice (I would describe it as airy) but can't find it anywhere. I am searching for a perfume from the 1970s called "it" but cant find it anywhere:( Thanks. I am looking for a fragrance that was available in the 70's. It was first worn by Madonna. The name is Madeline de Madeline. I had a cylendar clear bottle of perfume back in the early to mid 1990's that had a sponge tip applicator. I was told they discontinued it. The botyle was apx 4"long and about the circomference of my middle finger (ring size 5-5 1/2) it had a beautiful sweet woodsie jasmine smell if i remember correctly. I think the name had something like the name beauty on it i think. Too many years have gone by. I would love to find it again. It was my signiture scent.i hope u can help me. Can anyone identify a bottle of perfume I have from the early 90's. It was not a well known brand as I recall. The bottle is a deep true green and kind of urn shaped with a gold cap and shoulders. The cap looks like a Faberge egg. There was a cologne that I bought at JC Penneys in the 90s' that was a trio of colognes. I think one of them was a grass oil or musk. I can not remember the manufacturer. Please help. Does anyone know about vintage perfume oils made by Sunshine Spa (theyre a different company now, ive already asked them) in the 1970 and 80s, very floral and sensual, i have an old tiny bottle, no label, that STILL smells GORGEOUS but cant identify scents. I do remember what it looked like. Any advice?